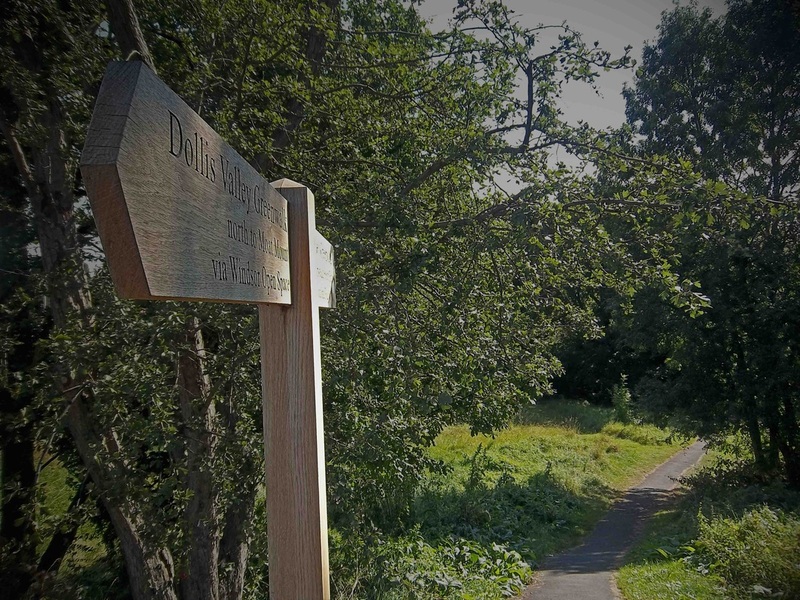 This way-marked run charts a path through the bulk of the Borough of Barnet, taking in some incredible green spaces along the way. Most of this route follows the Dollis Valley Green Walk (look for the green discs and the wooden finger posts). However, to connect easily to Tube stations we have added on an extra 2.3mi at the start (from Edgware Station) and have diverted the final section to follow the Capital Ring trail directly to East Finchley Station rather than on Hampstead Heath. Start: Edgware Station. Turn right to head north along Station Road. At the roundabout, turn right onto Penshurst Gardens and follow to its end. Use the short footpath to reach Hale Lane, turn left and then a quick right to go up Highview Gardens. Reach the A41 by turning right just after Highview Gardens makes a 90-degree turn left. 1.0mi: The A41. Use the footbridge to your left to cross the A41 and then follow the footpath on the northern side of the road to the right (east). Run over the M1, then under the following roundabout to come out on the east side of the A1 by turning left (north). 1.5mi: The A1. Keep to the righthand side of this road all the way up till you reach a car park set amidst the woods of Moat Mount Open Space, which is where we join the official Dollis Valley Greenwalk. 2.3mi: Moat Mount. With good way-marking the navigation should be far easier from now on. Enjoy the woods and fields of this nature reserve and also the views (as a reward for the 70m of vertical ascent you’ve just done). 3.2mi: Hendon Wood Lane. Turn right here and after passing a row of houses turn left into Totteridge Fields. Follow the hedgerows past grass fields (that can display wonderful wild flowers) till you reach Dollis Creek for the first time. 4mi: Dollis Creek. You follow the creek east (past farms that may have livestock in them) before crossing to the north side of the creek at some playing fields. Continue heading east past the houses on your left until you reach Barnet Lane and Barnet Playing Fields. 5.7mi: Barnet Playing Fields. The LOOP trail heads north here up to Monken Hadley, so be sure to follow the Dollis Valley way-markers. These will lead you east and then vere to the south as the Dollis Brook bends down through Wyatts Farm and Brook Farm. 6.9mi: Totteridge Lane. Turn right here and then follow the trail that begins on the opposite side of the road about 100m later. Follow the trail across the stream just before reaching Laurel Way. Cross the road and continue on the trail to Tillingham Way. At Totteridge Lane you can instead head to Totteridge and Whetstone Tube Station (Northern line; 50m to the left) to end your run. There are also toilets 500m away (left on Totteridge Ln and left again onto High Rd). 7.8mi: Tillingham Way. Here you have two options. Left will take you past Woodside Park Tube Station (another option for finishing your run) and right is more scenic, taking a left onto Southover and another left to be back with the brook (and the other trail option). 8.3mi: Argyle Road. After crossing this road, the trail sticks to the right (west) of the brook and makes three quick crossings just before the impressive viaduct train bridge. 9.3mi: Viaduct. Follow Dollis Road under the bridge and then make a left turn to once again follow the trail and creek (with the creek on your right). 10.5mi: The A1 Again. The trail passes under the A1 and soon after the Dollis Brook merges with Mutton Brook (together they form the River Brent). Follow the signs east alongside Mutton Brook (Dollis Valley Walk joins the Capital Ring Trail). At the junction of the two brooks, there are toilets 600m to the west along Bell Lane. 11.6mi: Addison Way. Turn left onto this street and be aware that Dollis Valley Greenwalk swings a right shortly after. Instead of following this route to Hampstead Heath, we want to carry on straight, following the Capital Ring signage, to our rail connection at East Finchley (it is also possible to carry on to Hampstead Heath and catch trains from Golders Green). Pay attention to the Capital Ring way-markers as the trail dives in and out of parks and suburban streets (there are toilets in the last park, Lyttelton Playing Fields). 12.6mi: Norrice Lea. At this street turn left, cross Lyttleton Road, turn right, and then immediately left into Vivian Way. Follow the Capital Ring signage via Vivian Way, Deansway (left), Edmunds Walk (right), and follow the paths into East Finchley Station and the end of your run, 13.2mi later. There are options to cut the run in half by stopping at either Totteridge and Whetstone Station (6.9mi from start, 6.3mi from finish) or Woodside Park Station (8mi from start, 5.3mi from finish), both of which are very close to the marked trail and signposted. Surface: Mostly sealed & dirt (some gravel & grass). Terrain: Hilly down to mild undulations. Weather Warning: Dirt trails scattered throughout the run can become very boggy in wet weather. Traffic Warning: Many road crossings. Times: Open at all times but some sections are not recommended after dark. Toilets: High Road (Totteridge), Bell Lane (Hendon), & Lyttelton Playing Fields. Start Point: Edgware Station, Borough of Barnet, HA8 (10.8mi northwest of central London). Finish Point: East Finchley Station, Borough of Barnet, N2 (6.1mi north of central London). Start: Edgware Tube Station (Northern line, Edgware branch). Finish: East Finchley Tube Station (Northern line, High Barnet branch). Thumbs Up: An excellently marked trail that passes through stunning parks and woods. Thumbs Down: A lack of toilets on the trail and the start connection from Edgware is not particularly scenic.